The Cateye Padrone Smart Triple Wireless kit is a great idea for a cycle computer that uses an app and your smartphone to get the most out of your bike ride. In the kit you get the computer, a speed/cadence sensor and a heart rate sensor. The kit only works with certain phones, though, so check out Cateye's list of compatible devices here before you purchase. It's very similar to the Cateye Strada Smart that Dave Atkinson reviewed recently. The big difference – the Padrone's big appeal, quite literally – is the size of the screen. The Padrone's is much bigger – the unit itself is 67.5 x 43 x 15.6mm (the Strada is 47 x 32 x 13.2mm) – meaning you can see everything on the screen clearly and easily while you're on the bike and when you're stopped. Like the Strada, the Padrone works in two modes, Mirror and Sensor Direct. Mirror Mode connects the computer directly to your phone, but lets you leave your phone in sleep mode so it saves on battery life and you can tuck it away safely out of the weather. 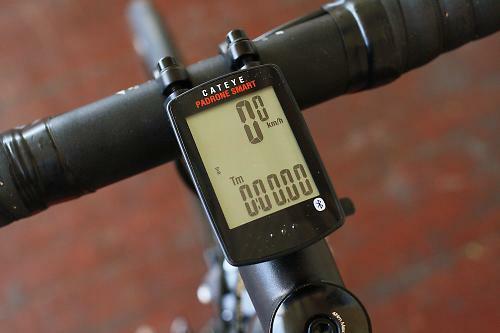 As well as displaying ride data provided by your phone's GPS, it tells you if you have a text message, a call or an email. Sensor Direct, as the name suggests, provides speed, cadence and heart rate information by connecting directly with the sensors via Bluetooth, so you don't have to take your phone with you. Although it all looks simple enough to install if you know what you're doing, if you've never had a device like it then the instructions could be a little confusing and you might need to look online for extra help. 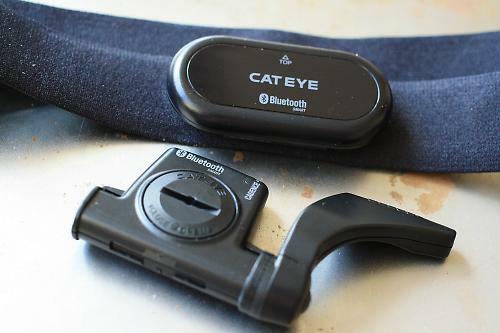 After reading the instructions, installing the Cateye Cycling app and mounting the bracket, you have to pair everything together. To pair the heart rate and speed sensors you simply activate them. There is a fair amount of fiddling about following app instructions (keep the paper instructions handy too), but I paired everything with no problems at all. Configuring the computer is straightforward too: you just set the time and which units you want. The Padrone and the associated app are Bluetooth only, so if you have any ANT+ sensors (such as a power meter) they won't work, even if your phone is capable of receiving ANT+ data, which many now are. Pairing your phone with the computer is really simple too, and once all that is done, you should be able to just hit record and go. The computer records data at regular intervals and has an auto-pause feature, meaning it pauses your ride when you stop, which is handy. In Mirror Mode it works really well. The connection between the mounted computer and my phone was seamless. The unit makes it easy to see all the data you want and is simple to work. You can view your heart rate, speed, distance and so on with ease. There are two main data fields. The one at the top defaults to speed, but you can switch it to heart rate or cadence if you prefer. The bottom field clicks through whatever other data is available, and that'll depend on how you're using the computer. There's total distance, elapsed time and two trip distance counters. Plus there's altitude in Mirror Mode and heart rate, cadence and power from any paired sensors. Average and maximum values for speed, cadence, heart rate and power are also available. Initially, in Direct Mode it had problems connecting to the sensors, so I contacted Zyro, whose technical experts were extremely helpful, and discovered that the sensor was faulty. Since replacing it I've had no issues with connection. The computer takes a CR2032 lithium battery, which Cateye says will last for around four months. Our experience of the Strada Smart, however, was that six weeks was a good run. I can't help thinking Cateye missed a beat here by not making the unit rechargeable. For £180, the Cateye Padrone Smart might not be for everyone. Mirror Mode would be its primary use, although having Direct Mode too does make it flexible. The price point makes it an individual choice, but it will save your phone battery life compared with running an app constantly – and possibly your phone's life as it can be tucked away safe from harm. Cateye says: "Smart technology meets our most popular display, the Padrone. Download the free CatEye Cycling app, stash your smartphone away safely in your jersey pocket or saddlebag and hit the road. Use Mirror Mode to get GPS-powered ride data, SMS (Text), call and email alerts from your phone displayed on the Padrone Smart's screen while your phone is kept safe from the elements in sleep mode, preserving the battery. "When carrying a phone isn't ideal, use Sensor Direct Mode to get speed, cadence, heart rate and power data directly from Bluetooth® Smart wireless sensors." The factory-loaded battery life might be shorter than the specification above. In Mirror Mode, connected to my phone, it worked very well, and after some issues getting it connected to the sensors in Direct Mode (and some help from Zyro), that worked really well too. Did you enjoy using the product? Yes, when it worked. how does this compare to the Wahoo Rflkt+? sounds like a similar concept? I like to use ride by GPS to record rides and for navigation. Will the Padrone display the app just as it is on my phone? Will it work with turn by turn directions? I bought this set up piece by piece from various sellers to save money. The instructions are a bit odd but once you get set up this is a great bit of kit. I have it set to upload each ride to CateyeAtlas Strava and Training Peaks. I have had two instances of the HR Monitor and Cadence / Speed Sensor disconecting from the headunit themselves during a ride otherwise it has performed flawlessly. and as I writ ethis prices are extremley reasonable. BUT check with Cateye website to ensue your phne handset's Bluetooth version is compatible it is this doubt that has affected the sales of this unit hence current low prices and restricted availability. If your phone is on the list buy it its great.